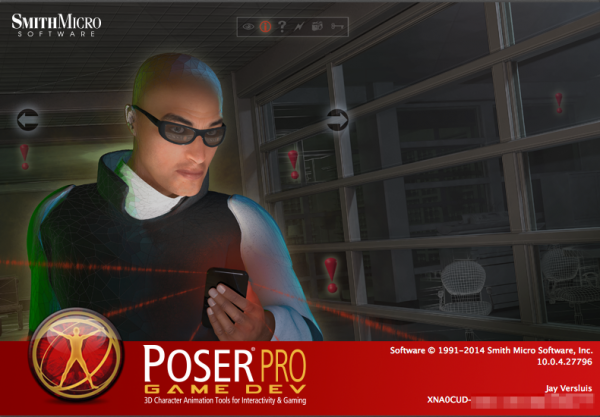 Poser Game Dev was released as part of Service Release 4 of Poser Pro 2014. It adds additional features to the app which can be unlocked with a new serial number. Essentially Poser Game Dev is the same executable as Poser Pro 2014. But how do we upgrade? Information on this topic is a tad sketchy: all we’re given is two download links to the SmithMicro Download Manager and a serial number. In this article I’ll talk you through how to upgrade without having to uninstall and reinstall the whole thing. I’ll also show you how to archive your installers for safekeeping. The Download Manager is a new tool that was introduced with Poser Pro 2014. It makes downloading the many files associated with the product a bit easier. All it really does is download installers on your behalf from a nice interface and offer a one-click installer for each portion of the app. We had to do this manually with many clicks before. Game Dev comes with a new version of the Download Manager. When you install it, your old version will be updated. Launch it when it’s ready and have your new serial number to hand, it will be requested upon launch, determining which downloads are associated with it. You’ll see two tabs at the top: Installers and Updates. At the bottom right you’ll see a button labelled “Download All”. You can click that and grab a coffee, or if you’re in a rush or on a bad internet connection, select desired component separately. Do the same on the Updates tab and the tool goes to work. I can see two updates available at this time: Service Release 4 (which includes Game Dev) and a Content Updater. Notice on the latter that this version is somewhat behind the service release and make a mental note of it. This is an issue that may be fixed by the time you try this. 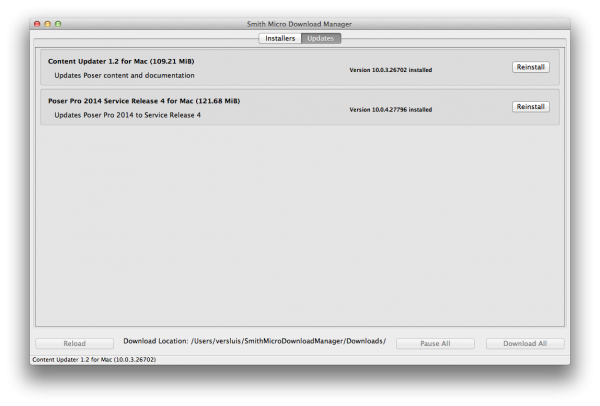 Let’s install the service release first, followed by the content updater. Grab a coffee and let each installation finish. 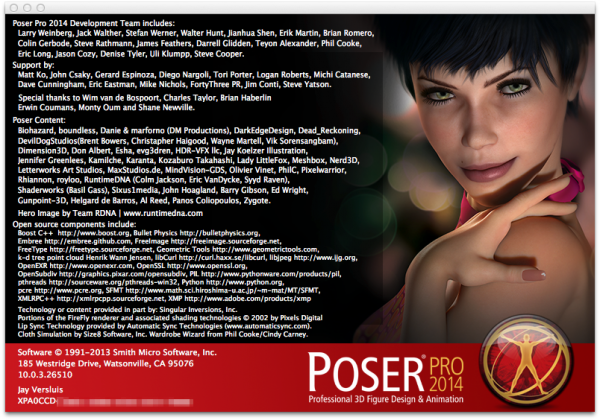 Now launch Poser Pro 2014 and you’ll see that splash screen with the raunchy brunette. Note that the version number should now read 10.0.4.xxxx or higher. If it’s still reading 10.0.3.xxxx then the service release has not been applied yet. In which case, quit Poser, go back and install it. Let’s add our new serial to the app: head over to Help – Personalize and paste it into the serial number field. Your current Poser Pro 2014 serial should automatically be transferred into the “previous serial number” box. Take this opportunity to activate your new version when prompted. Poser will prompt you to restart, so let’s do that. When you launch again you’ll be greeted with a new splash screen featuring the low-res bald dude, seemingly infiltrating that super secure facility with his laser gadget. Congratulations, you’re now rocking Poser Game Dev! Wait… Poser still looks the same – where are the new features? The latter is a new short manual that explains all those features. When you try to click that option right now, you’ll notice that nothing happens… the Poser Reference Manual still opens in Adobe Reader – but the new Game Dev Addendum does not. What gives? Sadly the Content Updater has neglected to update our user manuals! I guess this happened because the Content Updater wasn’t as up to date as the rest of the installers. It would have applied the latest changes to your content, but not to the manuals. Bad updater! To do this manually, we’ll have to go back into the Download Manager and run the Poser Support Files installer (under Installers – the second from the bottom, about 1.06GB in size). Download it and run the installer. Quit Poser before you do this, and close Adobe Reader if you were looking at the manual. When finished, launch Poser again and head over to Help and check out the new manuals. The Game Dev Addendum should now load fine, and the Reference Manual should read “July 2014” on the front, instead of “February 2014” (which was the old version). Note: if your Download Manager won’t let you install just the Poser Support Files component and says “Install Poser Pro 2014 to continue”, ignore this and fret not. There’s no need to re-install the entire application just to update a frigging manual. Instead, find the relevant installer file and run it manually. I’ll explain below how to find it (called PoserSupport.pkg on Mac and PoserSupport.exe on Windows). SmithMicro have always had a policy that when you buy digital software, you have 30 days to download it – unless you pay for the extended download service. This means that you may want to burn a DVD of that app for $499 you’ve just bought, preferably today rather than “later”. This rule of expiring downloads still applies, even with the introduction of Download Manager. Before the introduction of this super high-tech tool we had several download links and we could simply store the resulting installer files somewhere safe. Download Manager uses the same standalone files, so by poking deep into its file structure we can find those very same files. 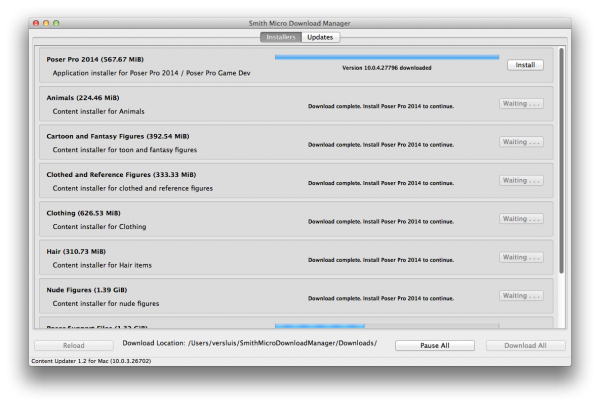 Go ahead and download ALL those installer files now, no matter if you need them right now or not. In here you’ll find several directories, two of which are release and update – representing those two tabs at the top of the Download Manager (Installers and Updates respectively). In either of these you’ll find two further directories: content and installed. Drill down further to find a win or mac folder (indicating the platform for the installers) and finally the actual installer files. There’s also a corresponding meta data file (.version) which we don’t need to archive. Save all the .exe files (Windows) and .pkg files (Mac) and you’ve archived your installers. In total there are 11 files per platform: 9 installers and 2 updaters. Note that these may be spread across the release and update folders, depending if you’ve installed (some) them or not. Download Manager moves the files to the appropriate directory when it’s worked them over. There’s no need to archive the .version files. Download Manager will default to the platform it’s running on and assumes that if you’re on Windows, you want to download Windows files. Likewise, on Mac it will show you the Mac downloads. It can however download either platform’s installers. You can change this under Edit – Preferences. Note that Download Manager can only show you one platform at a time. 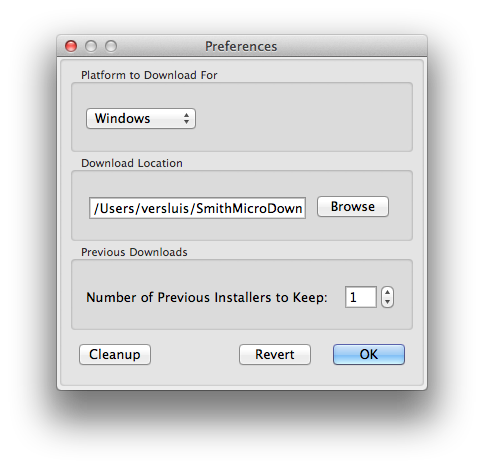 It will place the installer files in the appropriate directories (mac or win) as explained above. This allows you to archive both platform’s installer files on a single system. Once you’ve downloaded, archived and installed your new version of Poser, there’s no need to have those downloads occupying space on your hard drive any longer. On my Surface Pro for example space is limited. That’s where the Cleanup option comes in handy. It will delete all downloads from the system, except for those that are currently in progress (and of course those that you’ve copied to a safe location). You can use the Cleanup option even if you don’t have a serial number to hand: simply ignore the prompt and head over to Preferences which will display the above dialogue.